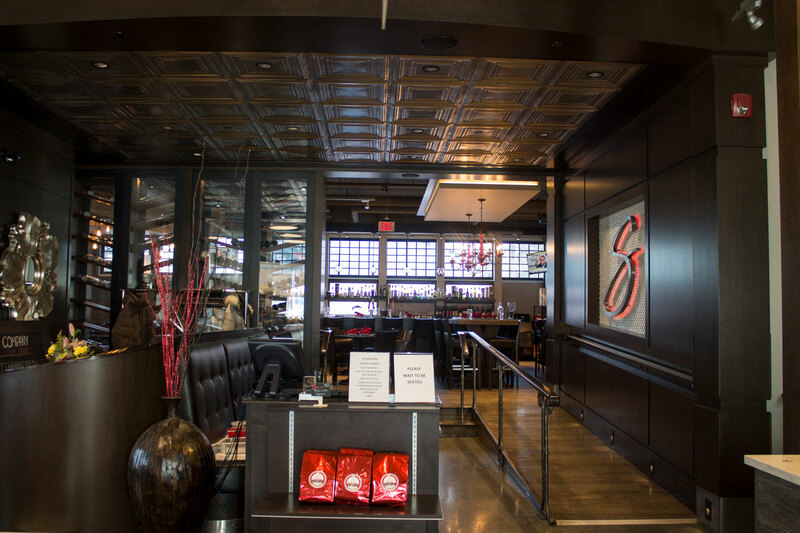 Before opening Sauce Italian Kitchen & Market, Jenna Bazzana was the owner of San Remo Ristorante, which had locations in McKenzie Towns, Garrison Woods and Oakridge. The most popular item on the restaurant’s menu was the spaghetti bolognese, which was made using her Italian mother’s beloved sauce recipe. 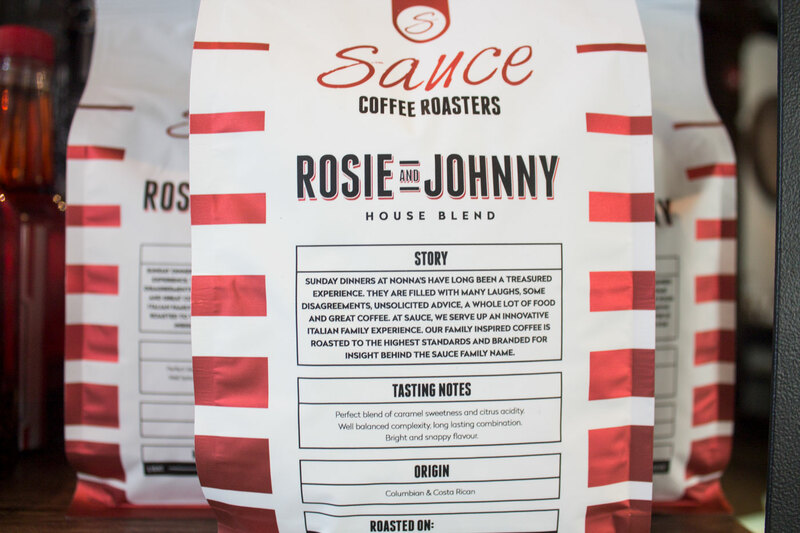 “We had it on our menu for many years and everyone used to say, ‘You really need to sell that sauce,’ ” says Bazzana, a trained chef who attended culinary school at SAIT. And so, Sauce Italian Kitchen & Market was born in December 2015. 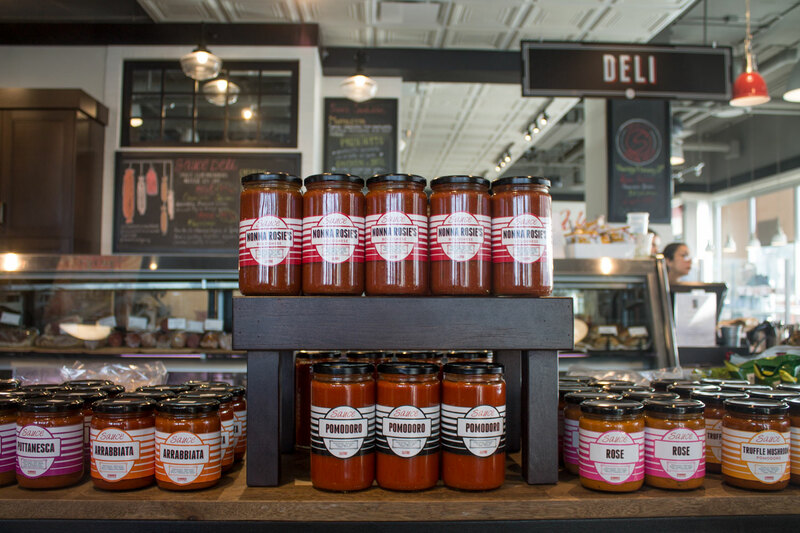 Sauce is home to a small market area, a deli, a bakery, a café and an Italian restaurant. It has a chic yet comfortable vibe, similar to that of a European food hall. In the mornings, groups of friends sip lattes and espresso at tables near the market’s large bay windows. Come lunchtime, the restaurant fills up and the line at the deli is consistent. Bazana says she sees a lot of returning customers, many of whom the staff know by name. 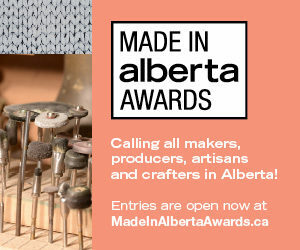 In the market, you’ll find many house-made items like popcorn and pasta sauce, as well as other brand name and made-in-Canada items. Meat, cheese and sandwiches are all available at the deli counter. Then there’s the bakery, which sells fresh bread, custom cakes (available for pre-order) and the “daily dough,” which is a list of savoury and sweet bread treats such as a jalapeño cheddar or cinnamon brown sugar swirl. You also get a pre-made lunch or dinner from the grab-n-go fridge or get a coffee from the café. Buy the same bolognese sauce that Bazzana’s mother made her when she was a little girl. This tall jar ($15) lasts around three to four servings, depending on how saucy you like your spaghetti. The market makes six kinds of pasta sauce, including pomodoro ($15), truffle mushroom, roasted red pepper, puttanesca and arrabbiata ($7). 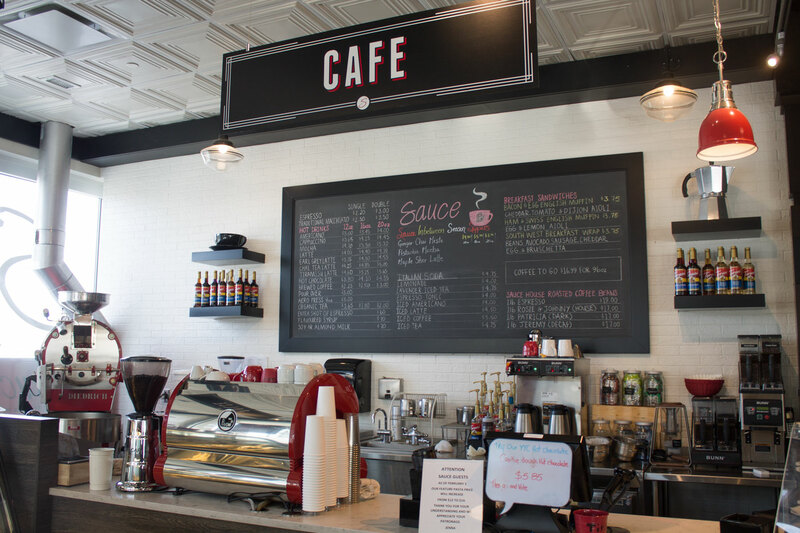 Since opening in 2015, Sauce has sold a staggering 100,000 cannolis at its café. Try the chocolate Skor caramel if you’re craving something sweet or the vanilla pistachio if you’re looking for something a bit more lightweight. 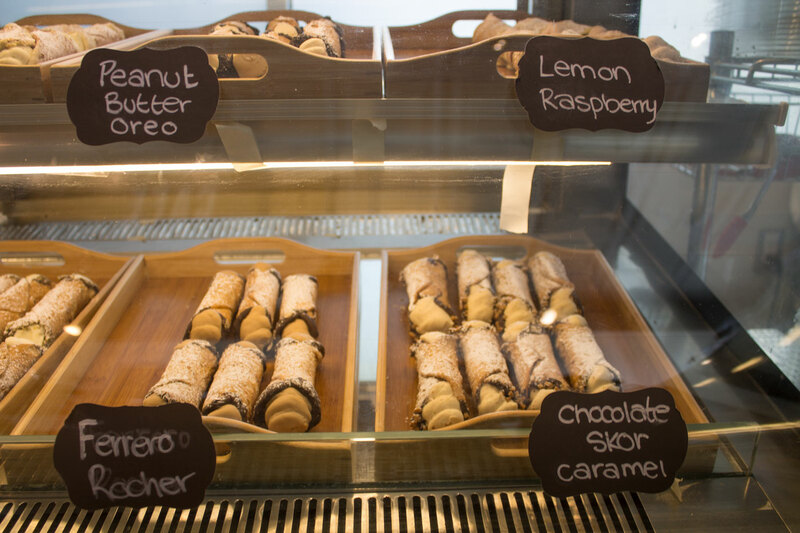 Each cannoli is just $3 and they’re made daily. You can buy a pack of four one-day-old cannolis for $8. 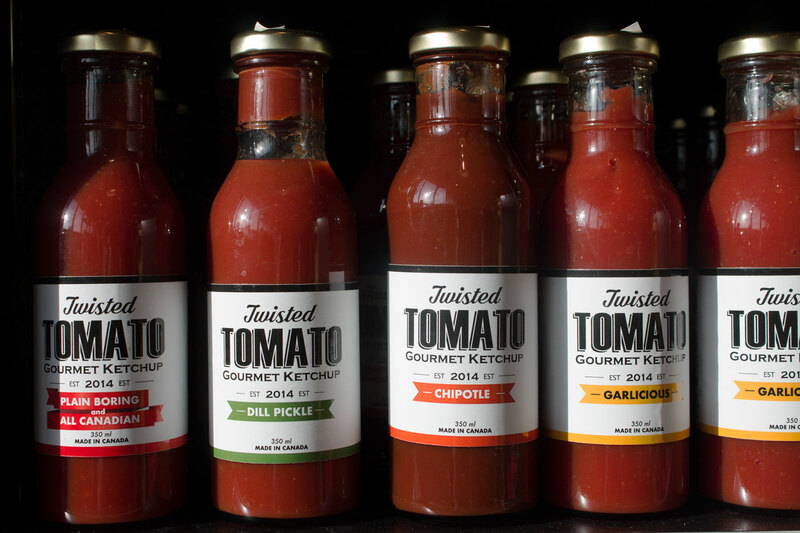 Elevate your ketchup game with this gourmet version from Canadian brand Twisted Tomato. Bazzana says the dill pickle ketchup is the Sauce staff’s favourite because it makes whatever you put it on taste like a McDonald’s cheeseburger. Other flavours include “plain boring and all Canadian,” chipotle, “garlicious,” bacon and smokey mesquite. All cost $8.99. If you want to make your own pizza at home, this makes it super easy. 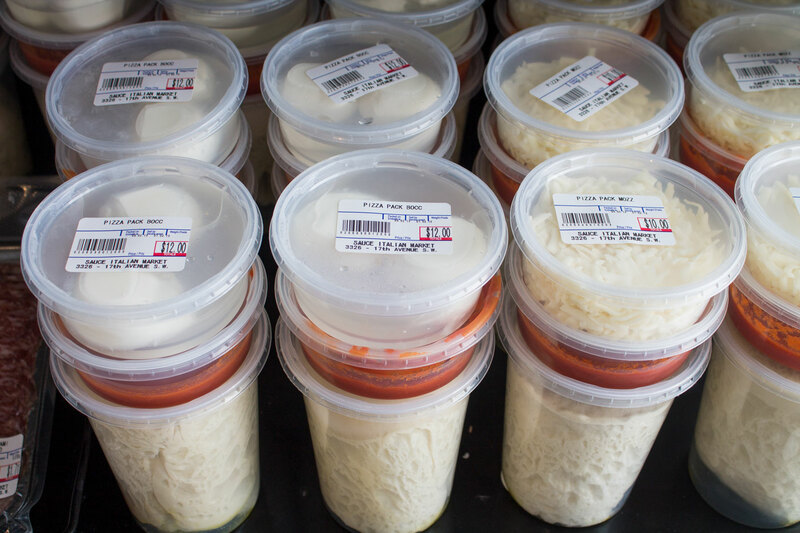 The pizza packs comes stacked with freshly made dough, tomato sauce and either boccaccini ($12) or mozzarella ($10) all in one. If you just want the dough, you can get that for $4. The dough and sauce are made in-house and the cheese is from Scarpone’s. 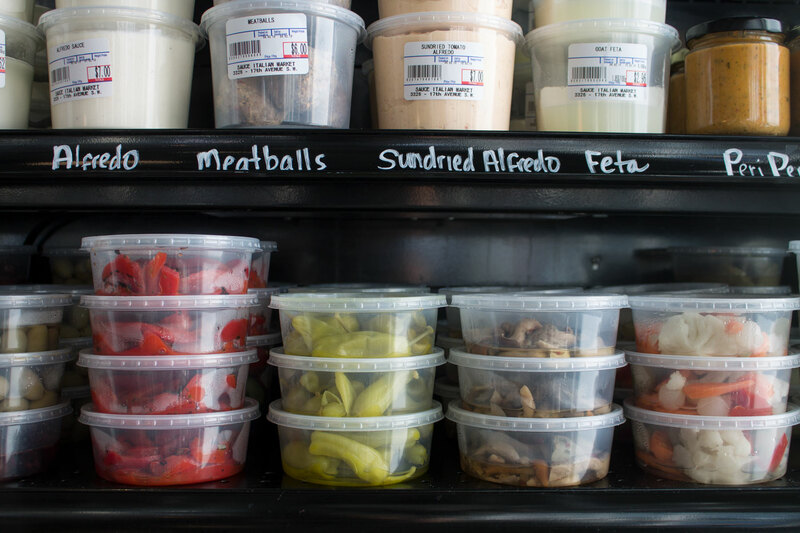 You can easily pick things for your next antipasti platter from the to-go fridge’s antipasti shelf. Choose from artichoke hearts, olives, mushrooms, pepperoncini, red peppers, pickles and more. Everything ranges between $1 and $5. If you want, add some fresh deli meats to your antipasti. 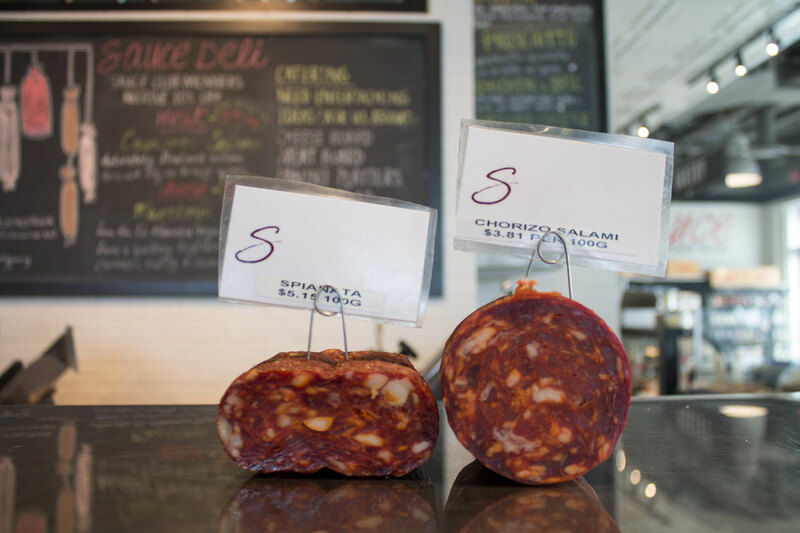 The chorizo salami ($3.81 per 100 grams) and spianata ($5.15 per 100 grams) add a nice fiery spice and bright colour to your plate. 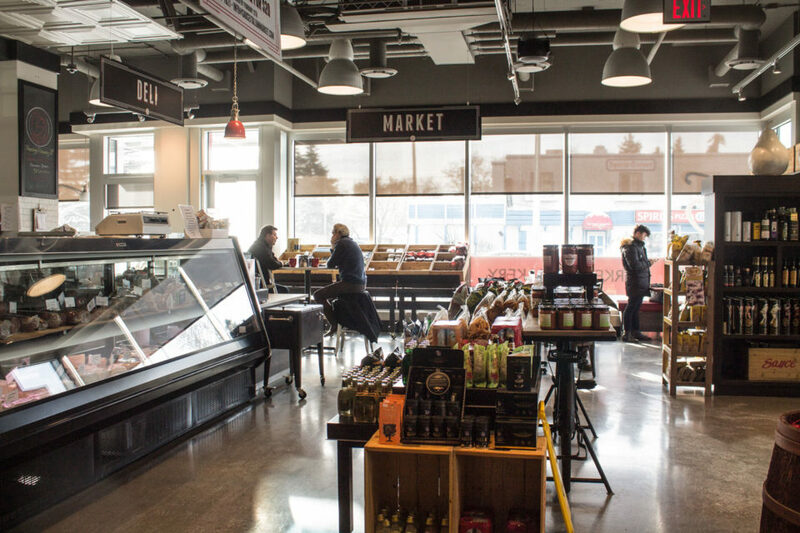 The deli works with Alberta-based Pratt’s Food Service, which gets its meat from across Canada. 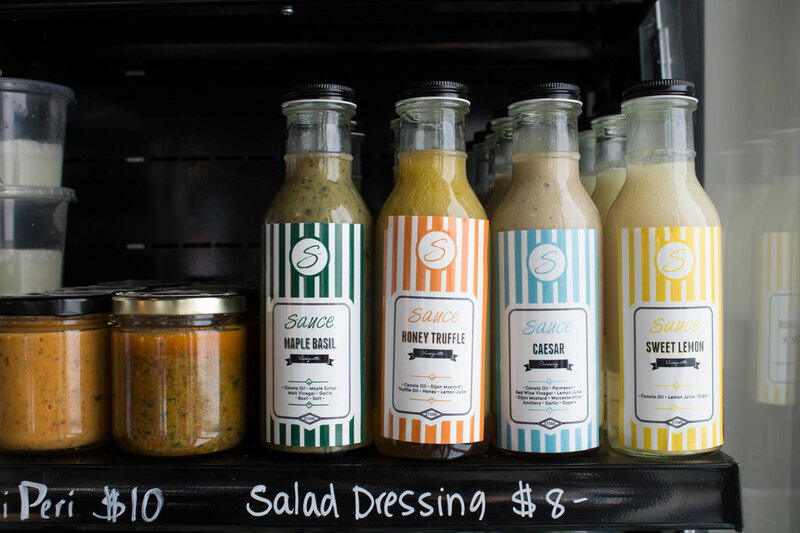 Top off a fresh salad at home with Sauce’s maple basil, honey truffle, Caesar or sweet lemon salad dressing. The sauces are made-in-house and are $8. 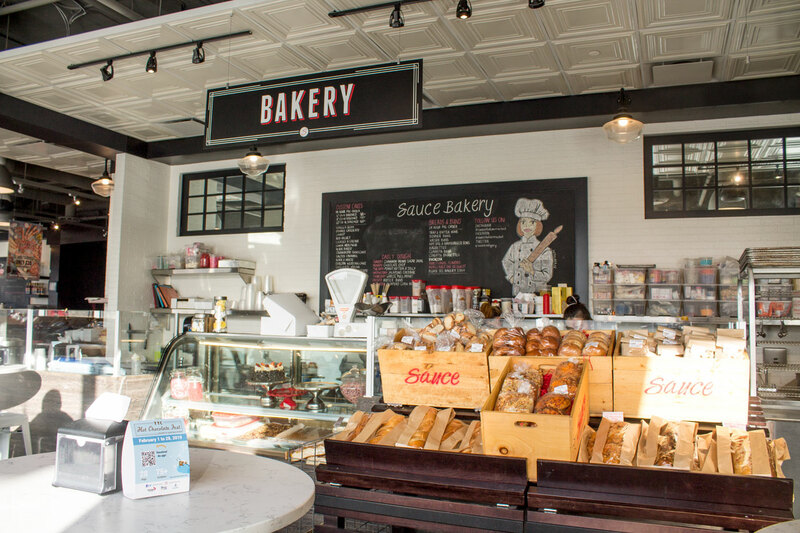 At the bakery, grab all kinds of house-made bread including cheese buns ($5), caramelized onion and mozzarella bread, and sundried tomato and pesto parmesan bread (both $3.50). 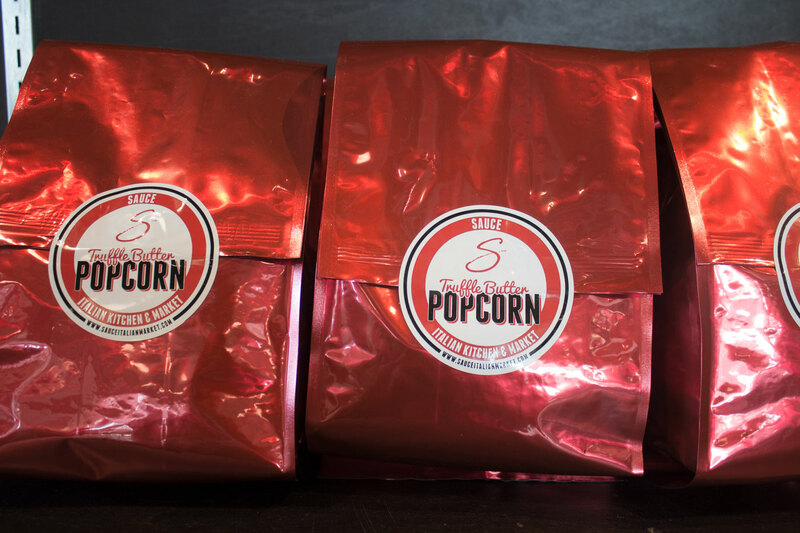 Sauce Restaurant sells bowls of its popcorn topped with truffle butter and parmesan for $6, but if you really love it, you can take home a bag from the market for $10.